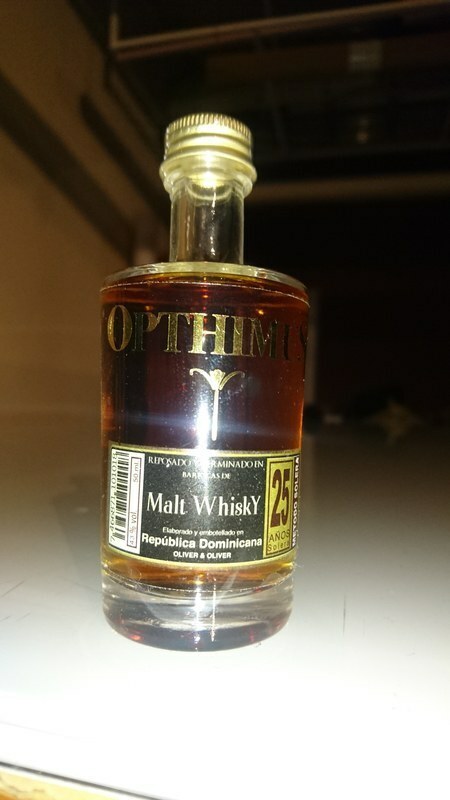 Have you found an online vendor selling Opthimus 25-Year Malt Whiskey Finish? A bit sharp in the nose, but very smooth in the mouth.Long lasting aftertaste, very good balance not nearly as sweet as other Opthimus. Im a fan! If you're into more complex rums, this indeed is an awesome choice. I can also recommend to try different vintages. The 2015 is much different than the 2013 for example. What an adventure! love it....prefere the Oporto Finish but the Whiskey Finish is perfect in combination with a cigar..
Helt fantastisk rom som er yderst kompleks. Den har det hele. It’s a complex Ron with lots of nice notes, but the strength (43%) don’t quite balance up the sweetness. You can clearly feel whisky notes in the end. With a little less sweetness it should have been a top rate. Picture: My Dom. Rep. Shelf. Für mein 200. Rating eine nette Flasche. Im Glas schönes rotbraunes Mahagoni mit Kupfer Reflektionen. In der Nase eine herrliche Tiefe die Dir das Wasser im Munde zusammen laufen lässt. Kandierte Früchte in Vanillesauce, karamellisierte und getoastete Hölzer liegen auf moosig torfiger Erde. Wow, jede Minute und jedes Grad wärmer bringt neue Düfte hervor. Im Gaumen gleitet eine Armada von Aromen süss (34 gr.) und sanft über die Zunge. Eine ganze Palette von tropischen Früchten wie Banane, Mango, Papaya aber auch weisse Trauben und rote Beeren werden von Karamell und Vanille zart umhüllt. Es sind aber auch herbere Aromen mit im Spiel so wie harziges Holz, angesengte Sägespäne, zart-bittere Schokolade, Waldhonig und frisch geschnittenes Gras. Im Abgang richtig süss und fast klebrig, herrlich und lang bleibt Karamell und Kakao. For my 200th rating a nice bottle. In the glass beautiful red-brown mahogany with copper reflections. In the nose, a wonderful depth that makes your mouth water. Candied fruits in vanilla sauce, caramelized and toasted woods lie on mossy peaty soil. Wow, every minute and every degree warmer brings forth new fragrances. On the palate, an armada of flavors glides sweet (34 gr.) and gently over the tongue. A whole range of tropical fruits such as banana, mango, papaya but also white grapes and red berries are delicately wrapped in caramel and vanilla. But there are also herbier aromas in the game such as resinous wood, scorched sawdust, tender-bitter chocolate, forest honey and freshly cut grass. In the finish really sweet and almost sticky, delicious and long remains caramel and cocoa. Har dog ikke smagt Port finish, men denne er bedre end 25eren. Lidt fed i smagen på den gode måde og tilpas sød. Foarte placut, fin si aromat, un rom desavrsit in bunul stil Oliver&Oliver. Intr-adevar se simte vechimea de 25 de ani. Un rom puternic, dulce si nu prea.. Only On The Rocks! 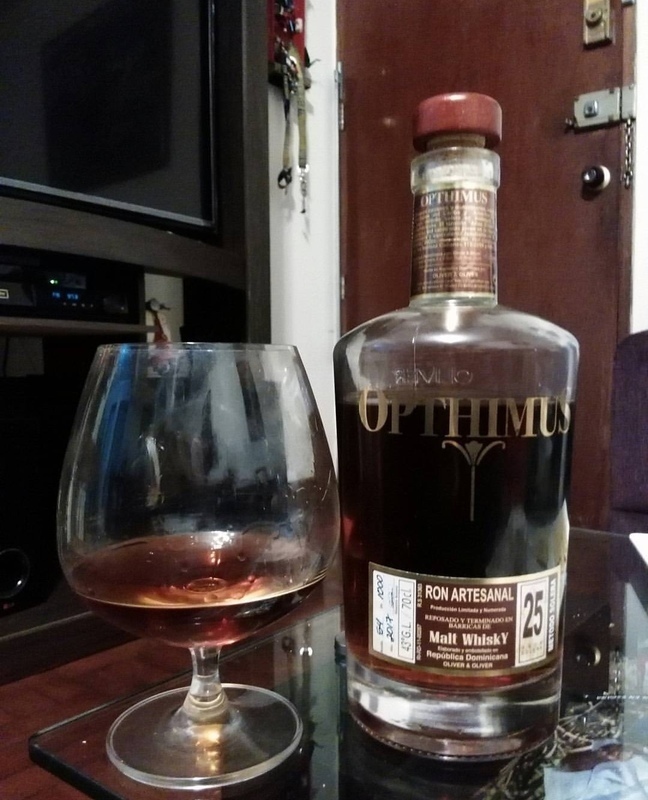 I recently had the chance to taste this delicious rum Opthimus 25 years Malt Whiskey Finish, but in principle as is already recurrent in Oliver & Oliver the presentation is rarely the best, on the other hand the mahogany color that presents is very attractive; The aroma of vanilla, fruits and a little coffee. By tasting it you can feel the great taste, soft, warm and with light notes of whiskey. Hace poco tuve la suerte de probar este riquísimo ron Opthimus 25 años Malt Whiskey Finish, pero en principio como ya es recurrente en Oliver & Oliver la presentación muy rara vez es la mejor, por otro lado el color caoba que presenta es muy atractivo; el aroma a vainilla, frutas y un poco de café. Al probarlo puedes sentir el estupendo sabor, suave, cálido y con ligeras notas de whisky. This one is just amazing! The finish in the whiskey barrel provides a incredibly balanced taste. Sweeter than many may like but the vanilla tones and smooth finish makes this sipping rum a desert replacement in my house. Husker ikke nærmere bedømmelse da det er et godt stykke tid siden jeg smagte den og blot gav en karakter. Dark caramel color with amazing aromas of vanilla and chocolate! Cheers! Lækker rom. Hel klart den bedste af opthimus serien. Skal prøves. Although this is a great whiskey age rum, I found the regular Opthimus 25 and 21 to be better, as well as the Opthimus 25-Year Port Finish. I'm generally not a fan of whiskey aging, but this is one of the best whiskey aged rums I've tried. Smells and tastes of sweet molasses, oak, and whiskey. Quite nice! Aromen von Honig, Toffee, Vanille, Kaffee, Kakao, Schokolade und etwas Eiche. Langer Abgang geprägt von süssen und würtzigen Nuancen.